It's true! Spelling for kindergarten should be simple, useful and intentional. Spelling lists and practices should not be mindless, grueling or boring. So how can you pull this off? Use the recommendations and word lists that follow, and you'll be on the right track! What Words Should Kindergartners Learn to Spell? 1. One of the very first words every kindergartner should learn to spell is his/her name. 2. Other spelling words should be those that have everyday meaning for students and are simple to spell. 3. Kindergartners should also learn to spell words in simple word families, such as the ad, an, ap, at, ed, en, et, ig, in, ot, and ug families. How Should Kindergartners Learn to Spell? 1. Students should learn to spell their names by repetitive use. Each time they color a paper or come to the board, ask them to write their names. Use their names frequently in classroom displays, such as chore charts, cubbyholes, and so on. 2. Students should read their new spelling words. When you assign five new spelling words, for example, also give your students short text selections that include all or most of these words. Read the text together, then ask kids to circle the spelling words and write them again on the back of the page. 3. Students should write their new words in worksheets, on the board, and in repetitive work. For instance, you can ask students to write a new word three times in a row, each time with a different color, just to keep it fun. 4. Students should spell their new words aloud. Take two minutes of transition time to spell the new words aloud as a group. Encourage students and parents to work together on the new words at home. 5. 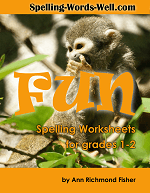 Students should participate in fun learning games that reinforce their burgeoning spelling skills. Keep it light, keep it fun, and keep it coming! Kindergarten Sight Words - Use these kindergarten sight words to strengthen early learners' reading, writing and spelling skills. When student can master these simple words as early as kindergarten, they'll be off to a great start with their language skill-building! Check out this article on Phonics for Kindergarten. You'll find some overlapping valuable information. 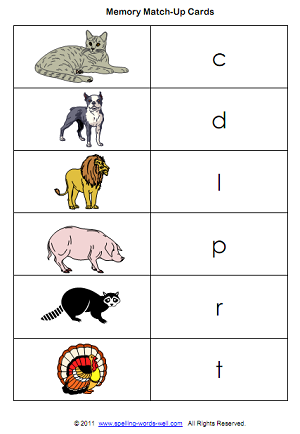 These Phonics Activities and Worksheets are also very helpful when planning spelling for kindergarten.